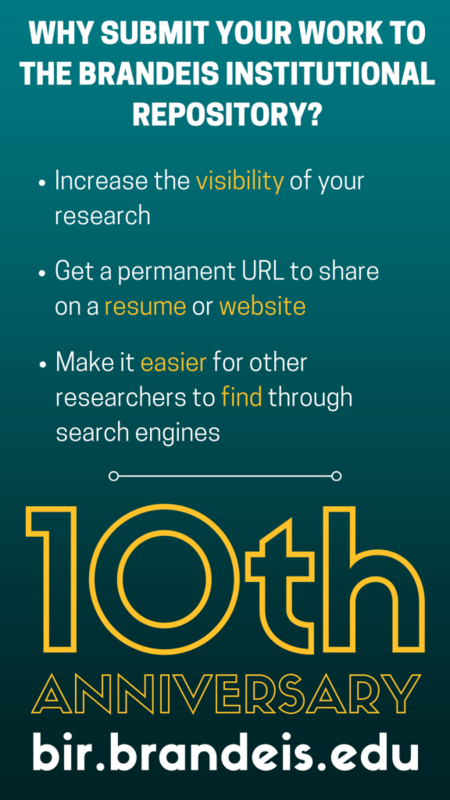 The Brandeis Institutional Repository (BIR) celebrates its 10th anniversary this year! What exactly is the institutional repository? Well, it functions as an archive for collecting, storing and distributing research to the scholarly community of an institution. The BIR was established in 2008 as a resource for the Brandeis community to showcase, organize, share and preserve the research output and scholarship of the University. The BIR is a historical record of the research done by our faculty, students and staff. More than this, the BIR contributes to the ever-growing world of scholarly communications and the research cycle by providing greater access to that output. In other words, the BIR contributes to the scholarly communication landscape by providing access to scholarly material that is open and free to all. The objective of Open Access is to encourage the dissemination of knowledge and research freely across the internet. The BIR works closely with the Brandeis University Press, the Classics Department, Archives and Special Collections, the Cohen Institute, the Women’s Studies Research Center—just to name a few. The content found in the BIR is organized into communities to reflect the academic and administrative organization of the University. We have within the collection more than 100 faculty publications, 14 digital collections through Archives & Special Collections, 550 GSAS master’s theses and much more. We collaborate with the Classics Department and the Classical Studies Artifact Research Collection (CLARC). We also provide training and teach students the importance of metadata in describing physical objects to make them discoverable to the scholarly community. Archives & Special Collections continues to add new and unique collections to the BIR. One of the most popular collection in the BIR is the Honoré Daumier Digitized Lithographs Collection. There are approximately 5,000 digitized images in the collection. This is a distinctive resource for the study of Daumier’s art and 19th-century French history. Another interesting item is an early modern Venice Receipt Book, which provides a glimpse into the everyday life in the Jewish community of Venice. Why submit your work to the BIR? It’s a great place to house your scholarship. For faculty, it is the place to keep a digital copy of your publications in one place. For students who are working on theses or major projects on campus, the BIR helps preserve your academic achievements while at Brandeis. And for staff, it is the place to house your conference papers and any key achievements in your field. Brandeis research and education showcased in one location! The Honoré Daumier Digitized Lithographs Collection was one of the major collections uploaded to the BIR. Our most viewed item is Daumier’s Gargantua, with 10,839 views over the course of 10 years. The BIR is the only resource that houses the Lenny Bruce audio recordings, which are personal recordings from the family. The Venice Receipt Book was featured in the Judaica Europeana newsletter. Brandeis University Press, a member press of the University Press of New England (UPNE), has been a leading contributor to the BIR. Over the course of 10 years, we have added 57 ebooks from BUP to the BIR. CLARC was one of the first collaborations back in 2008, starting with 300 objects and 1,000 images. There are now 631 objects in the BIR. GSAS was the first to start depositing master’s theses digitally into the BIR. It has now become standard practice. Not only does the BIR contain scholarly papers, it has musical compositions, audio recordings, images of 3-D molecules and much more. If you ever wanted to see Brandeis before it became Brandeis, the BIR houses a digitized copy of the Middlesex University Collection, which includes a series of photographs. Do ever wonder what life was like for Irish immigrants in Boston from 19th century fighting in the American Civil War? Well, you can read Michael Lally’s letters in the BIR. Michael Lally was a young Irish immigrant from Roxbury, Mass., who served the Union during the Civil War. There are a total of 57 letters.